I stayed home for the Labor Day holiday. With a good low tide, however, I spent the morning hiking the beach into Similk Bay. There are always interesting things to find in the intertidal zone. 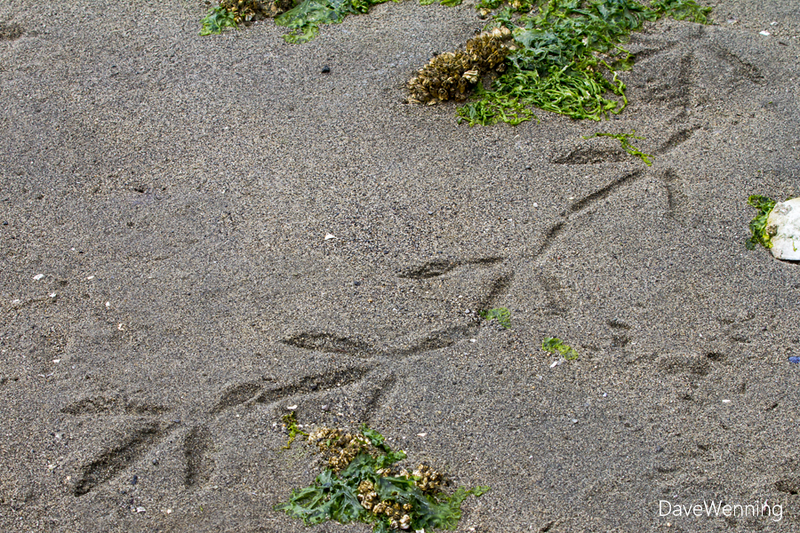 These tracks in the sand, for instance, were quite large and probably mark the route of a Great Blue Heron. Come along and enjoy this photo gallery of the things that I found. The shells of Varnish Clams (Nuttalia obscurata) littering the beach have an interesting story. They are recent immigrants from Asia. 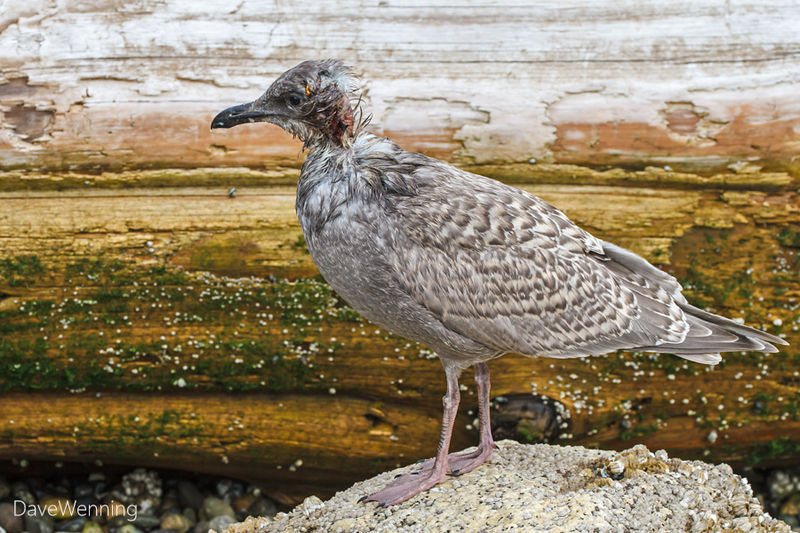 It is believed they entered the waters of the Salish Sea when Asian transport ships dumped ballast water near Vancouver, B.C. in the 1990's. 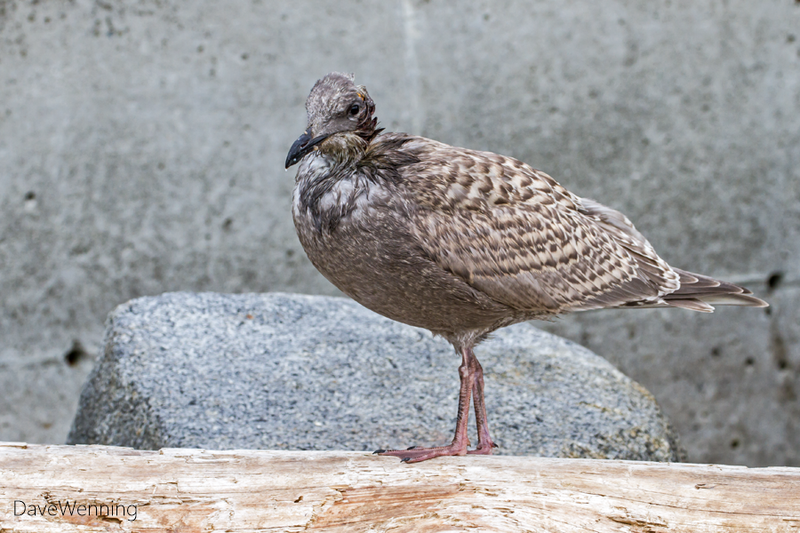 They now inhabit the North Sound, Strait of Georgia, Strait of Juan de Fuca and west coast of Vancouver Island. 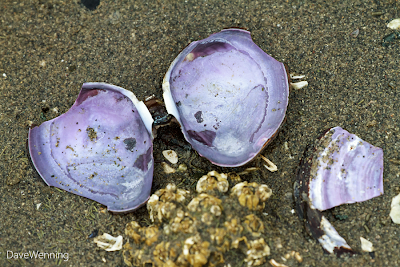 The empty shells are always broken, thought to be due to predation by by Dungeness Crabs. Speaking of Dungeness Crabs, we have those too. This is the empty shell of a baby that lost it's life somehow. This is a typical Puget Sound beach, with some areas sandy and others rocky. 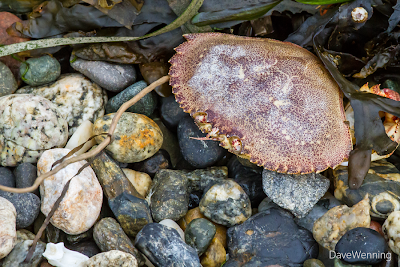 The rocky shores of north Puget Sound provide amazingly diverse ecosystems. Where there are rocks, there will probably be things using them as anchors. 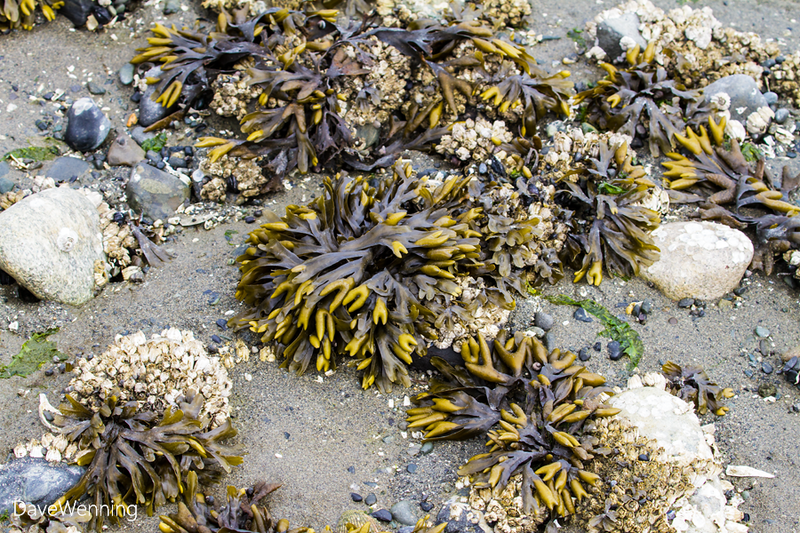 Here, barnacles and Rockweed (Fucus distichus) are abundant. Flip the rocks over and you will likely encounter the pugnacious Purple Shore Crab (Hemigrapsus nudus). 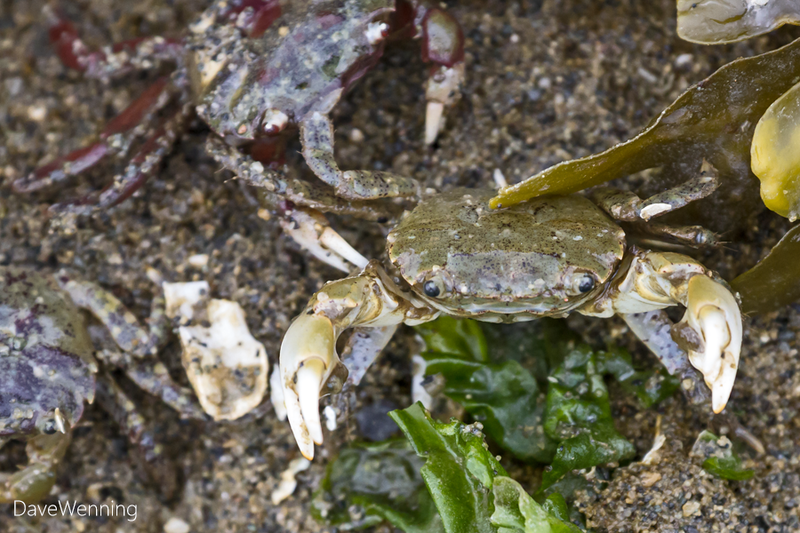 These are tiny crabs with big egos. They will gladly take you on if you mess with them. They are not always purple. Shades of red and green are common and some even have white carapaces. 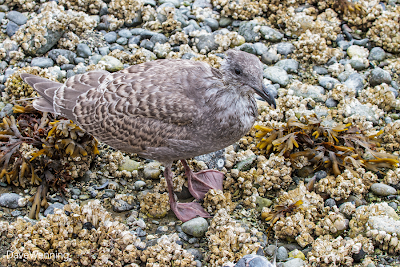 This juvenile gull took me by surprise. Normally they don't let you get near them, but this one was approaching me. I could see he was injured when he walked right up to me. I wondered if he was seeking my help. Would they do that? Could he have been pecked at by the other gulls like domestic chickens do? 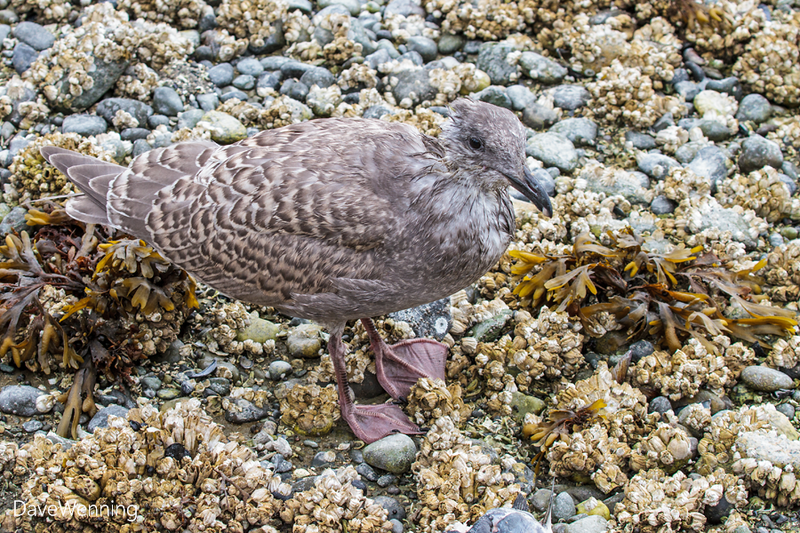 There were several around, but they seemed to be leaving him alone. 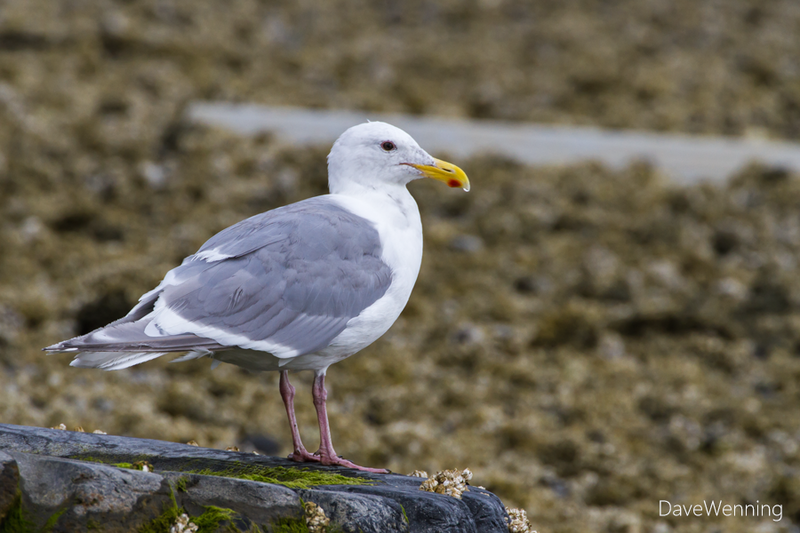 The juveniles are hard to distinguish, but the adults around at the time were Glaucous-winged Gulls (Larus glaucescens). I felt bad for the little guy. He did not seem to be in distress, but his behavior was obviously abnormal. I always want to help in these situations, but of course, what can you do? 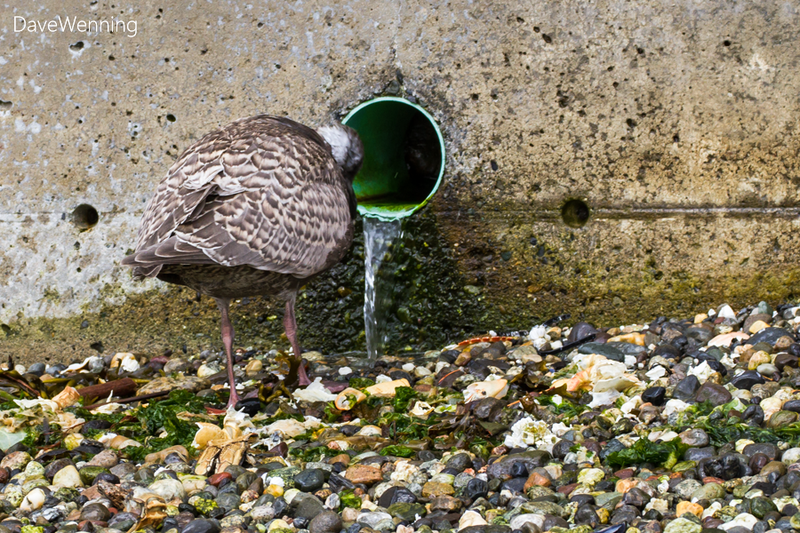 Just before I moved on, he got himself a drink of fresh water at the weep hole of a bulkhead. I'll take that as a hopeful sign. 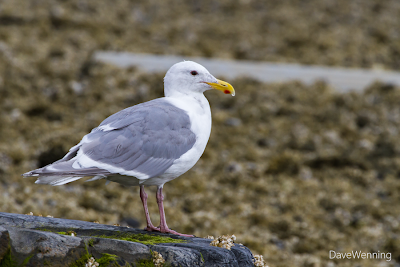 This is one of the adult Glaucous-winged Gulls that was nearby. The seasonal gray-brown winter mottling on the head and neck is just beginning to appear. This is not a photo that will win any prizes, but there are a couple of interesting things in it. I believe the large, white flowers are Kneeling Angelica (Angelica genuflexa). It is another member of the Carrot Family with a big taproot, and it is a cousin to the Cow Parsnip. Now look in the center of the photo (right-click to view full size). The blue-green leafless stems with light bands are Equisetum hyemale or Scouring Rush. This is a member of the ancient and primitive Horsetail family. In the fossil record, their ancestors date to the Carboniferous Period between 300 and 360 million years ago. 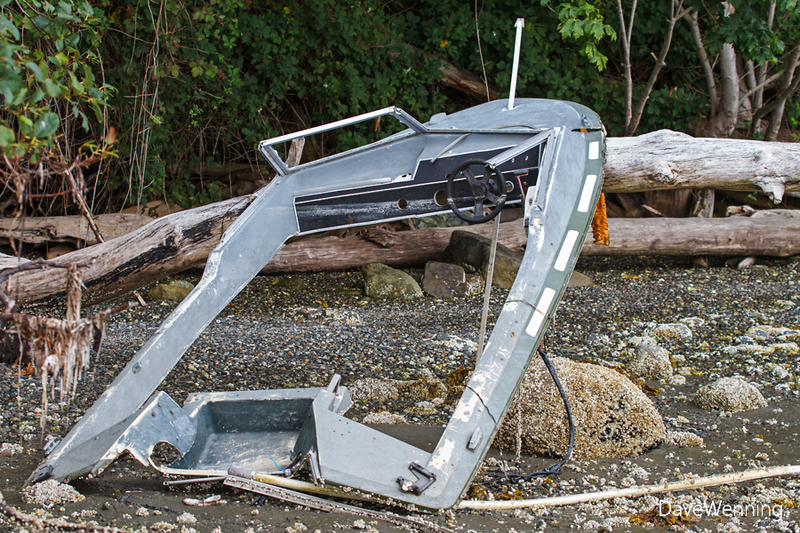 The site is at the base of a high clay bank, right at the high tide line along the western shore of Similk Bay. 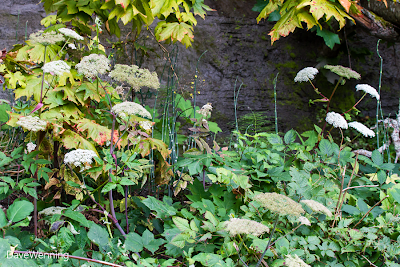 Water constantly seeps out of the bank providing the wet conditions that both plants like. Nearby, and all along the shoreline, the Himalayan Blackberry (Rubus discolor, R. armeniaca) also finds conditions it likes. Actually, I am not sure there are conditions it doesn't like. 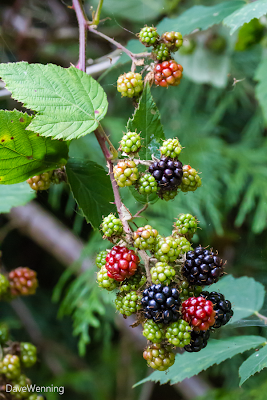 This is a terribly invasive shrub that was unfortunately introduced by Luther Burbank. Where it gets a foothold, it can rapidly overwhelm everything in its path. Here it is growing in almost total shade in the same wet conditions as the two plants above. In my yard, it will thrive in arid glacial till in full sun. 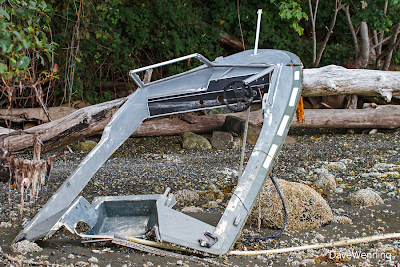 Similk Bay is a where somebody's boat came to die. Because of the winds, currents and storms, things tend to collect here. There is a huge driftwood pile in the northwest corner. Years ago, someone on South Fidalgo tried to build a bulkhead out of old tires. That idea was a failure and now they have all come home to the beach in Similk Bay. Next in Part 2, the hike back home.